Thus Spore now has an average of 2-stars on Amazon. The game as gotten good but not excellent reviews, so this is surely of concern for the makers as people will probably take the Amazon rating seriously and might not buy. Is this a concerted campaign to shame EA (Spore's publisher/distributor) or a distributed disorganized consumer reaction against DRM itself? I tried Googling for "Spore DRM campaign" thinking I'd find a Defective By Design campaign about it, but couldn't find anything. The moment concentrated actions like protests lead to dis-organized collective action and rebellion en masse is very exciting. If these are actual consumers acting in concert but without prompting from a centrally organized campaign then it means that our efforts at establishing DRM as an anti-feature have been successful. There's a real easy way to get around the DRM. If just one person installs Spore on a VMWare or Xenapp virtual machine, he could put the vm image on a torrent or website for everyone to download and play Spore. There’s a real easy way to get around the DRM. If just one person installs Spore on a VMWare or Xenapp virtual machine, he could put the vm image on a torrent or website for everyone to download and play Spore. 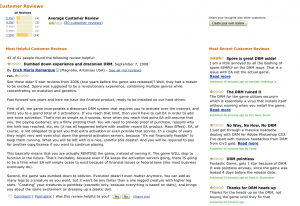 I went to Amazon because I was intrigued by the game after playing the iPod mini-game. I almost never play computer games, so it's a big deal when I break down and decide to procrastinate from real life responsibilities to play them. 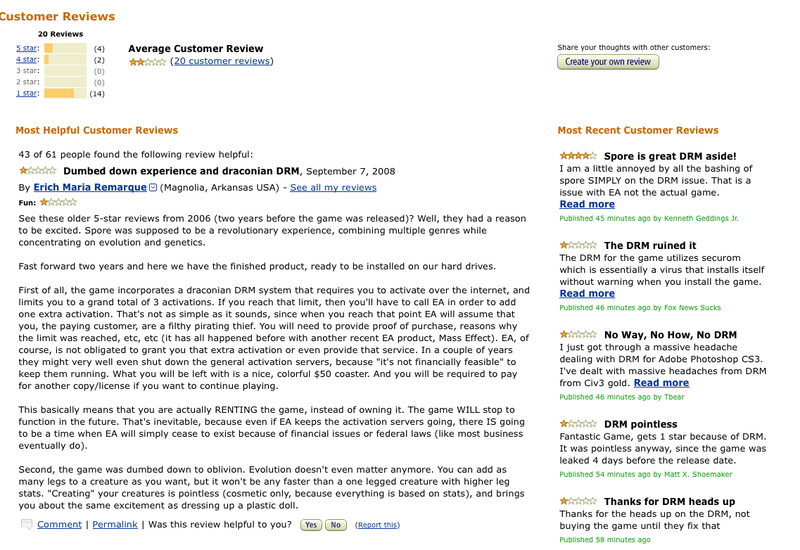 I knew nothing about the DRM when I went to Amazon, and after reading a handful of reviews I figured it out and was absolutely horrified. I then left my own one-star review. Unlike some, I'm not just making noise. I intended to buy the game, but because of the assinine DRM policy, I will not. It now has over 2.3k 1 star ratings. giving it less than 2 star average rating on amazon. EA what have you done! Some of the reviewers on Amazon (the “Best” one for a short while) are also not being forthright in their disclosure. I've written about this as well. It isn't just restricted to Spore. Go and check out the Amazon reviews of Far Cry 2, Mass Effect, Crysis Warhead...all the same story. hey... i have a question.... i bought spore but i cant get it to stop freezing!!!!!! any suggestions?? P.S. i have windows xp. I agree , no more "advice" about DRM.